BOISE, Idaho -- Potatoes that won't bruise and apples that won't brown are a step closer to grocery store aisles. The Food and Drug Administration on Friday approved the genetically engineered foods, saying they are "as safe and nutritious as their conventional counterparts." The approval covers six varieties of potatoes by Boise, Idaho-based J. R. Simplot Co. and two varieties of apples from the Canadian company Okanagan Specialty Fruits Inc.
Okanagan, based in British Columbia, is trying to make apples a more convenient snack with its non-browning version. The company says bagged apples wouldn't have to be washed in antioxidants like they are now, a process that can affect taste. Neal Carter, the company's founder, says they want to see bagged apples become as prolific as bagged baby carrots. "We know that in a convenience-driven world, a whole apple is too big of a commitment," Carter said. The apples are dubbed Arctic Apples, and Carter said he wants them to be labeled as such, since they bring an advantage to the marketplace. The first two varieties to get the non-browning treatment will be Granny Smith and Golden Delicious, and Carter says there won't be significant plantings until 2017. 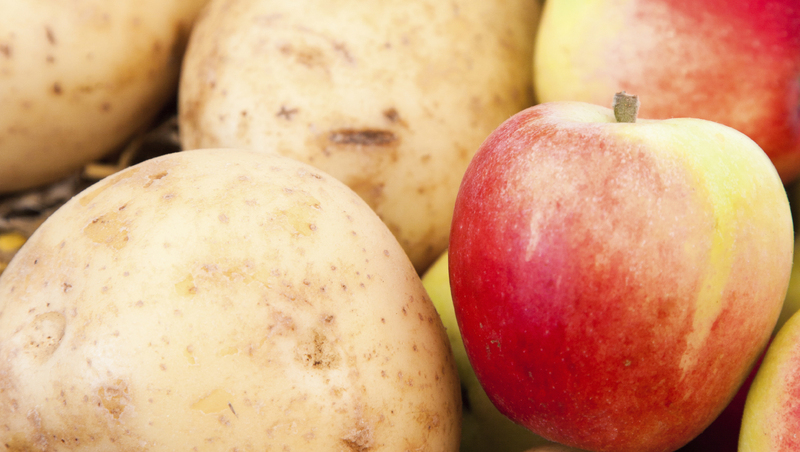 Simplot calls its potatoes Innate and the varieties selected include Ranger Russet, Russet Burbank and Atlantic. "We're trying to improve potatoes so everyone gets a better experience, just like it's right out of the field," said Haven Baker, vice president of plant sciences for Simplot. The potatoes have 40 percent less bruising from impacts and pressure during harvest and storage then conventional potatoes, which the company said could reduce the more than 3 billion pounds of potatoes discarded each year by consumers. Unlike in Europe, where there are strict regulations governing genetically modified organisms (GMOs), in the U.S. the FDA review process is voluntary. Both companies asked for a review to ensure their products met safety standards. As part of the process, FDA compares safety and data of the genetically engineered food with conventional varieties. The federal government does not require that genetically modified foods say so on their labels, although polls have shown a majority of consumers want to know. An Associated Press-GfK poll in December found 66 percent of Americans support mandatory labels on genetically modified foods. About 40 percent said they consider it "very" or "extremely important." Despite consumer unease and ongoing controversy, genetically modified ingredients can already be found in a wide variety of products in American supermarkets. A Consumer Reports study last year found that scores of items from cereals to baby formulas to snack chips contained some ingredients which have had their DNA manipulated. Aware of potential resistance from consumers, Simplot officials say Innate potato traits come exclusively from genes from domestic potato varieties. It could be years before the potatoes become available to the average customer. The company has about 400 acres of Innate potatoes in storage from the 2014 harvest that it plans to deliver to growers, packers and shippers to be sent to a tightly-controlled network for use in small-scale test markets. The company said those markets haven't been determined, and it's not clear yet how the potatoes will be labeled. The company said it's not selling Innate seed potatoes on the open market. "I think everybody wants to get what they pay for," said Doug Cole, Simplot's director of marketing and communications. The potatoes will have 70 percent less acrylamide, a chemical that can be created when potatoes are cooked at high temperatures, the company says. The company is touting that as a potential health benefit, as some studies have shown acrylamide to be a potential carcinogen, though the National Cancer Institute at the National Institutes of Health says scientists "do not yet know with any certainty" whether the substance can be harmful in food. The FDA in its approval Friday noted that acrylamide has been found to be a carcinogenic in rodents. However, one of the company's oldest business partners -- McDonald's -- has previously said it has no plans to use genetically modified potatoes. The company didn't respond to inquiries from The Associated Press on Friday. Gregory Jaffe, biotechnology director for the Center for Science in the Public Interest, in a statement Friday objected to the voluntary system for approving genetically engineered foods. "There's no reason why these 'Arctic' apples and 'Innate' potatoes would pose any food safety or environmental risk," he wrote. "That said, the process for allowing such new crops is badly flawed. Congress should pass legislation that requires new biotech crops to undergo a rigorous and mandatory approval process before foods made from those crops reach the marketplace." Simplot is working on a second generation Innate potato that will have additional traits, including resistance to late blight, which the company said will result in a 25 to 50 percent reduction in the need for pesticides. Late blight helped cause the Irish potato famine of the mid-19th century.